As part of a major customer event at the Distributed Power business headquarters in Jenbach, the 20,000th Jenbacher gas engine was ceremonially handed over to Ludwig Weiss, the director of Milchwerke Oberfranken — one of the leading international manufacturers of cheese specialties. Celebrations took place yesterday afternoon. Among the guests were the mayor of Jenbach, Dietmar Wallner, numerous employees and customers of the engine specialist, as well as media representatives and students from the nearby universities and technical colleges. 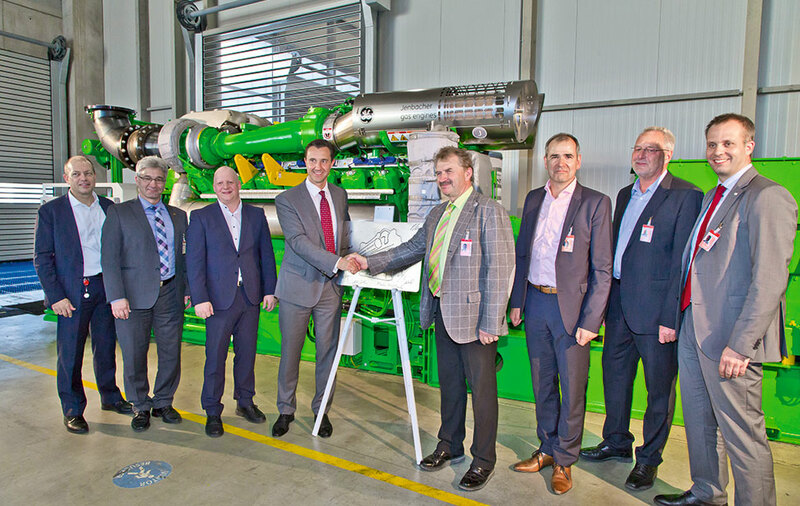 In addition to the order for a natural gas-powered Jenbacher J612 gas engine, which includes a control system, Milchwerke Oberfranken also signed a 10-year service contract. Energas BHKW GmbH, the authorized Channel Partner of the Distributed Power business in Southern Germany, handled the order. The commissioning of the combined heat and power (CHP) plant system at one of the leading international manufacturers of cheese specialties is planned for the beginning of 2019. The CHP system is used to generate power, heat and steam as well as hot water for pasteurization at the company's site in Wiesenfeld near Coburg, approximately 120 kilometers north of Nuremberg, Germany. Due to its broad use, the plant achieves an overall efficiency of around 86 percent. The electrical output is 2 megawatt (MW) and the thermal output is 1.8 MW. This corresponds to the power consumption of almost 4,000 and heat consumption of 1,500 average German households. With annual savings of 5,000 metric tons of CO2, the Jenbacher CHP plant at the Milchwerke Oberfranken will make an important contribution to achieving the Federal Government's goal of reducing greenhouse gas emissions by at least 40 percent by 2020, compared to 1990 levels. Additionally, the Jenbacher CHP plant is characterized by its high flexibility. It can either run on an island-mode basis and supply the dairy facility with energy independently or it can be operated in grid-parallel mode. If the CHP system delivers more energy than is needed on-site, it is fed into the public grid. "With our technology, we are creating a bridge to a greener energy future for Germany. One example of this is our 20,000th Jenbacher engine, which as part of a combined heat and power plant, does more than just ensure the energy supply of the Milchwerke Oberfranken facility. It also helps our customers to increase their profitability and at the same time improve their eco-balance due to significant CO2 savings," explains Norbert Hetebrüg, executive director sales Europe of GE's Distributed Power business. First considerations for the integration of a CHP system at one of the two Milchwerke Oberfranken sites were already underway in 2011. In the course of the preparatory work, the heat acceptance structure of the plant was successively adapted and optimized for CHP system operation. The "magic triangle” once again played a role. In addition to an increase in energy-supply security and a significant improvement in the life-cycle assessment, the operating efficiency was also a decisive factor in favor of the CHP system. With an annual production volume of 47,600 metric tons, Milchwerke Oberfranken is one of the leading international manufacturers of cheese specialties. Every year, more than 850 milk producers supply the tradition-rich company with 1.2 million liters (or 430,000 metric tons) of milk, which at two high-tech plants are processed into hard, sliced and soft cheeses as well as convenience foods such as baking camembert. GE's Distributed Power business, which also includes the Jenbacher and Waukesha product lines, is a leading provider of power equipment, engines, and services specializing in power generation and gas compression that’s close to the consumer. The Distributed Power business’s product portfolio includes high-efficiency, fuel-flexible industrial gas engines that generate 200 kW to 10 MW of electricity for numerous industry branches worldwide. In addition, the company supports more than 48,000 gas engines worldwide throughout their entire service life, helping companies to master their operational challenges and be successful - anywhere and at any time. With service providers in more than 100 countries, Distributed Power's global service network will contact you locally to respond quickly to your service needs. GE's Distributed Power business is headquartered in Jenbach, Austria. Energas BHKW GmbH is an important provider of ecological energy solutions with efficient combined heat and power plants in Southern Germany. Specializing in the installation of gas-fired CHP systems in the power range between 300 kWel and 9500 kWel, it has been a certified sales associate since its foundation in 2006. Since 2012, it is also a service partner of the Distributed Power business. GE Power is a world leader in energy, offering technologies, solutions and services along the value chain from energy producer to energy consumption. Our technologies are used in more than 180 countries, produce one third of the world's energy, and supply 90% of the world's energy suppliers. Using our software, we manage more than 40% of the world's energy. Through continuous innovation and collaboration with our customers, we develop the energy technologies of the future and improve the power grids on which we rely every day.